Log cabin in beautiful Lappish setting. Experience night-less summers, extended ski season from November to May and the Northern Lights. Sleeps 7-8. 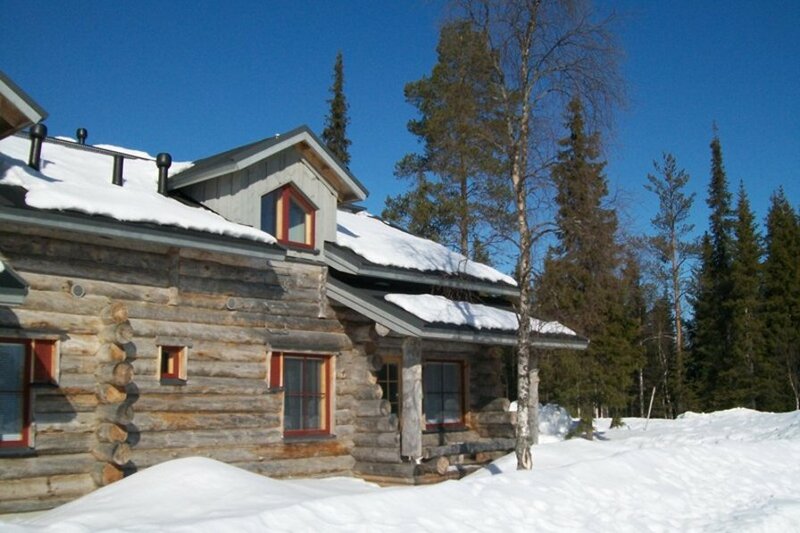 Our new log cabin (constructed end 2008) is situated in the heart of the beautiful Lappish village and ski resort of Akaslompolo, high above the Arctic Circle. The cabin is in walking distance of all the village amenities (including large supermarket and restaurants) and ski bus stop, yet is set within a lovely tranquil setting. The extended ski season from November to May offers guaranteed snow for downhill or cross-country ski-ing, snowboarding, sledging or even a husky dog or reindeer ride or perhaps a visit to see Santa Claus! After a day in the snow relax in front of the cabins wood fire or in the cabins own private sauna. The summer months offer 24 hours of daylight enabling you to experience hiking, cycling, fishing & canoeing in the beautiful fells, lakes and rivers. The Northern Lights are visible from October to March with the cabins terrace providing the perfect viewing platform. Our log cabin offers all home comforts. It is an ideal base for families to explore the beauty of Lapland. The ski-ing opportunities are endless. The cabin is situated very close to cross-country ski tracks (some flood-lit). In total there are 330kms of cross-country ski tracks in the area. The cabin is in walking distance of the ski bus stop which will take you to the 58 downhill pistes with the longest piste being 3000m. Ski school lessons are available in English. Toboganning is another great activity for children. There are several safari companies offering excursions and activities all year round. For the summer, Akaslompolo is situated around a large picturesque lake ideal for boating and fishing. Bikes are available to hire for use on the extensive walking tracks and fells. The village comprises a very large well stocked supermarked (with ATM), several restaurants/bars, ski shop, gift shops and two large hotels. During the ski season there are direct charter flights to Kittila airport which is approximately 45 minutes drive from the cabin. Alternatively you can travel from London to Kittila via Helsinki (BA/Finnair), or via Stockholm to Kiruna (SAS) in Northern Sweden (approximately 2.5 hour drive). There are also flight options to Rovaniemi (approximately 2.5 hour drive). An overnight train is also available from either Helsinki (Easyjet) or Tampere (Ryanair) to Kolari (30 minutes drive from cabin). Car hire is not essential but can be useful. Airport transfer buses are available as are ski buses to the downhill slopes (ski bus stop is a few minutes walk from the cabin).